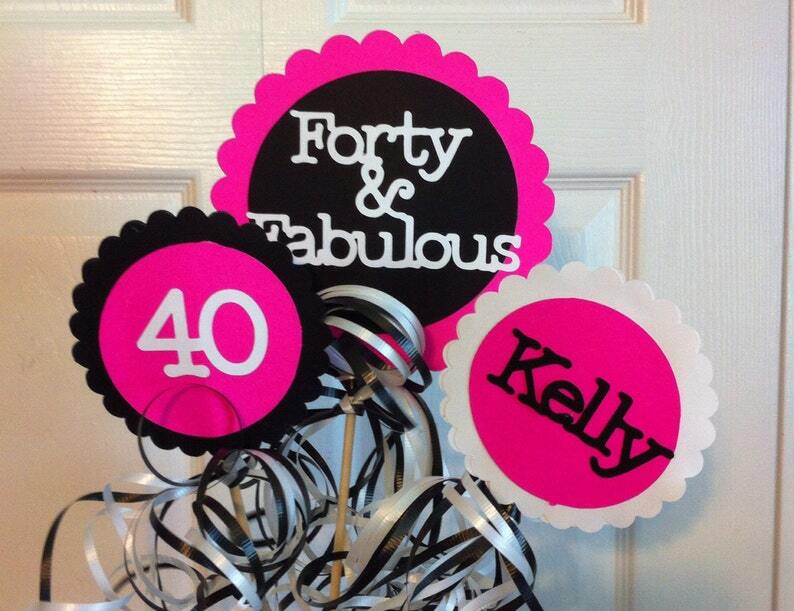 This is a super cute add on for our Fun Numbers Celebration Banner Theme. This set includes one nice size double sided centerpiece signs (approx 6.25") and two small (approx 4.25") that are placed on a large dowl with lots of fun curly ribbon. Place these in flower vases, snack trays, display in empty wine bottles and more! They add just a little extra to carry your party theme around your event space. These can be put together in colors of your choice to celebrate a Big Birthday or Anniversary. Black for Over the Hill or silver and gold for that special anniversary this fun centerpiece display item helps set your stage. Created in Your custom colors and available with your own custom text as well. (Space permitting) The smaller signs can only carry a number or name. Please include the following on checkout. Please feel free to convo with us for details or questions. We can also put together other fun items in this theme for you as well such as banners,cupcake toppers, confetti, party favors and more. Check our our other fun items in our Etsy store for more fun ideas. Have an idea on something you don't see, just convo with us and perhaps we can help. We Love custom orders.